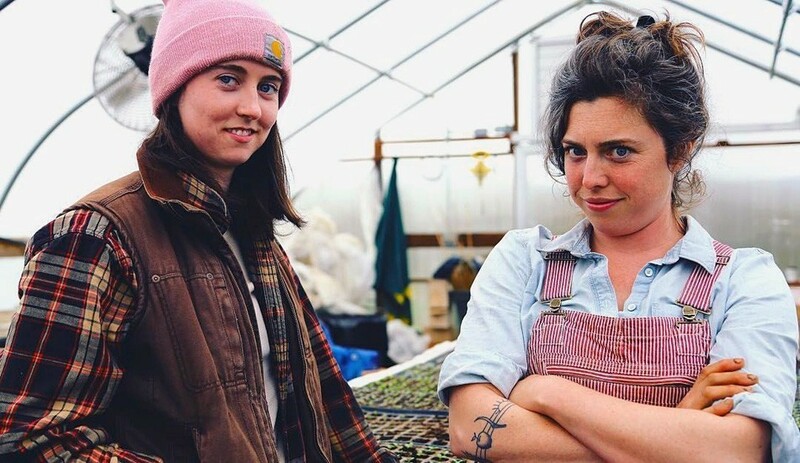 We met with Alexis Barbalinardo (right, in the photo above) and Enya Cunningham (left, above), organic farmers at Back 40 Farm who are passionate about connecting people to the environment and healthy food. We learned about the important work they do in environmental stewardship and their thoughts about living and working in Washington. Tell us about Back 40 Farm. The Back 40 Farm is a family owned business located on 60 acres of some of the best farmland in Washington. Our mission is to grow quality organic produce and distribute fresh healthy food to our extended family and community. Our farming goal is to return more to the earth than we take out and we strive to serve as an educational source to generate dialogue about the sustainable food movement. Back 40 was started 7 years ago by Lesley and Bill King as a small garden and has now grown into a thriving organic farm, CSA, artisanal store (Back 40 Mercantile) and restaurants (Back 40 Kitchen and Mill Street Bar and Table). AB: After college, I grew vegetables and flowers in Northern California and worked as a cow-herder and cheese maker in New Jersey. Prior to Back 40 Farm I worked for two years at the Stone Barns Center for Food and Agriculture in Pocantico Hills, New York, where I was a greenhouse grower and propagator. EC: I was introduced to Alexis through a mutual friend at Vassar and began working at Back 40 Farm right out of college. I love working with my hands and wanted to find meaningful work relating to our food system – so this was a perfect fit. At Vassar, I was part of the Slow Food USA chapter and was a leader in developing the student CSA program on campus. What do you like about living and working in Washington? The natural environment in Washington is unparalleled and environmental conservation is a high priority here. Organizations like Steep Rock Association and the Washington Environmental Council are remarkable environmental stewards. People in town support and value their natural environment and open space. There is a strong community spirit both amongst residents and the business community. We are involved with the First Friday events run by Valley Spirit Cooperative & Wellness Center in the Depot, a great event that fosters strong community connections. Tell us about some of your community outreach initiatives. We’re currently working with local school programs to help educate young people about farming and nutrition. We’ve partnered with the Gunnery on a nutrition course and students come out to the farm as part of the course work. We are also quite involved with Steep Rock Association, helping with bird counts, nest watches and frog and pond monitoring projects. We are avid birders and are very excited to help SRA. As our farm borders the Steep Rock Preserve, we are able to assist with several important initiatives. We also participate in town events such as the Future Now Expo, spearheaded by the Washington Environmental Council. We are both involved with the New Connecticut Farmer Alliance, which supports emerging farmers throughout the state. Dinner at Hidden Valley featuring local seasonal harvest – you have to reserve a spot! To learn more, visit Back 40 Farm.